Most Worshipful Michael P. Baker Sr., Grand Master of Masons in Hawaii recently attended the 2015 World Conference of Regular Grand Lodges in San Fransisco, California. 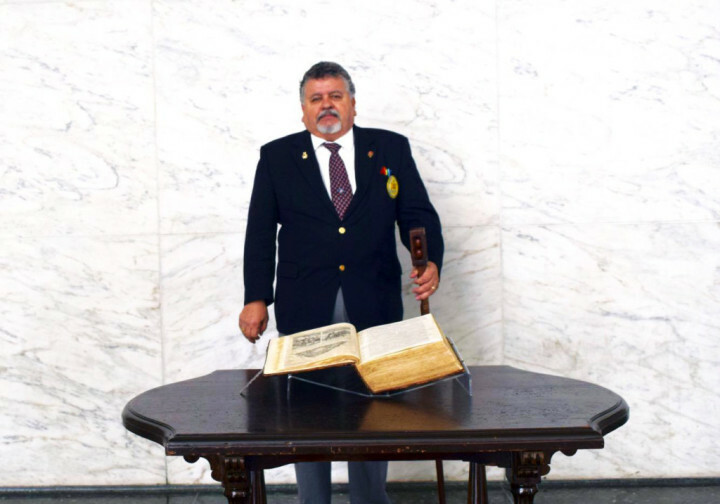 While attending the World Conference, the Grand Master was able to view the historic George Washington Masonic Bible, which was used to inaugurate Brother George Washington as President of the United States of America. Please read below for a comprehensive description of this extraordinary piece of American history..
“On March 8th 1770, St. John’s Masonic Lodge suffered a catastrophic fire at its old Lodge room at Scotch Street. In addition to losing its earliest records and Lodge furnishings, the original Lodge Bible was destroyed in the conflagration. On November 28th, 1770, the Master of the St. John’s, W:. Jonathan Hampton, presented a replacement Bible to the Lodge. At the time, printed Bibles were an expensive rarity and the Lodge was fortunate indeed to benefit from W:. Hampton’s generosity. Scarcely could the Brethren of the time have predicted that within a few short years the Colonies were to sever their ties with their mother country and the Bible was to become the very cornerstone of a new nation founded upon the Masonic principles of liberty and equality. The Bible is the King James Version, complete with the Apocrypha and elaborately supplemented with the historical, astronomical and legal data of that period. It contains numerous artistic steel engravings portraying Biblical narratives from designs and paintings by old masters and engraved by the celebrated English artist, John Stuart. After the conclusion of the War of Independence, New York City became the first Constitutional capital of the United States, and it was there on April 30th, 1789 that Brother George Washington was to be sworn in as the first President of the United States. On a platform erected for the purpose, in front of the then City Hall, were gathered the Congress of the United States, with George Wash­ington and Chancellor Livingston, Grand Master of Masons in the State of New York. In front of them was an immense concourse of citizens. It was indeed a great holiday occasion; the Revolutionary War was over and peace reigned throughout the country. “On this sacred volume, on the 30th day of April, A. L. 5789, in the City of New York, was administered to George Washington, the first president of the United States of America, the oath to support the Constitution of the United States. This important ceremony was performed by the Most Worshipful Grand Master of Free and Accepted Masons of the State of New York, the Honorable Robert R. Livingston, Chancellor of the State. Fame stretched her wings and with her trumpet blew. Great Washington is near. What praise is due? The Bible has since been used at four other inaugurations: President Harding in 1921; President Eisenhower in 1953; President Jimmy Carter in 1977 and President George Bush Sr. in 1989. It was also to have been used for the inauguration of George W. Bush in 2001, but rain prevented its use. It has also been present at numerous public and Masonic occasions, including Washington’s funeral procession in New York, December 31st, 1799; the introduction of Croton water into New York City, October 14th, 1840; the dedication of the Masonic Temple in Boston, June 24th, 1867, and of that in Philadelphia on May 24th, 1869; the dedication of the Washington monument in Washington, February 21st, 1885 and its rededication in 1998; and the laying of the cornerstone of the Masonic Home at Utica on May 21st, 1891. It was also used at the opening of the present Masonic Hall in New York on September 18, 1909, when St. John’s Lodge held the first meeting, and conferred the first Third Degree, in the newly completed Temple. More recently it featured at the World Fair in New York, has been displayed at the CIA Offices outside Washington D.C., and at the Famous Fathers & Sons exhibition at the George Bush Memorial Library outside Dallas, Texas in 2001.